An observer is a person who watches what happens but has little to no visible active part in it. Parents of an “observer” often struggle to understand why their child “just sits and watches” while others are up and joyfully playing with their parents and the other children. Perhaps your little one is an observer and you are wondering if his or her development is normal. If so, you will connect with the parents I’ve interviewed. 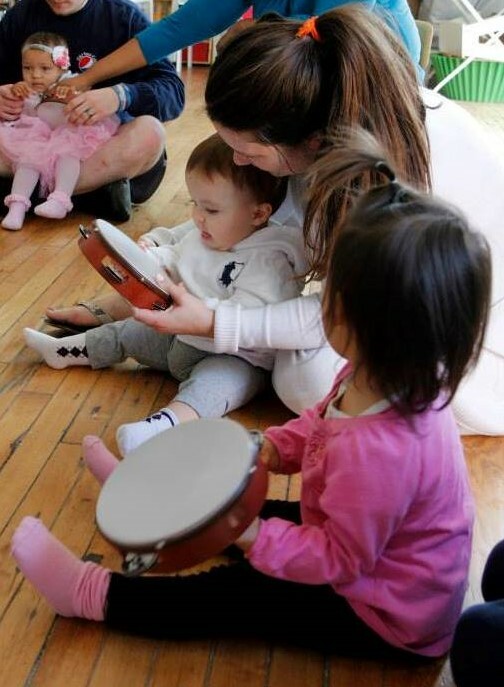 These four families have been attending WeJoySing for a minimum of 9 months up to 2.5 years and have had a variety of teachers within the WeJoySing program. Two of the children attend the evening sessions and two attend mornings. The parents were asked the same questions and you will see similarities in all the replies which show how your “little observer” is still gaining from his/her WeJoySing classes. In this two part series, you’ll read how these parents guided their child through this observation process to gain new skills and a greater sense of security to joyfully, on their own, actively participate in class. YOUR “OBSERVER” IS JUST FINE!! It is through observation that your child learns…through watching. As your “little observer” watches the musical activity, he/she is mentally very busy processing all the information he/she is “meeting and greeting.” Your child is getting to know and understand the activity through observations. This observation process gives your child a greater sense of security once he/she begins to be actively involved with the experience. Rylan: My child sits on my lap pretty much the entire time. She watches the other children and teacher but does not really sing along or participate. My first born wouldn’t even go up to get an instrument from the teacher or to get la-la’s. My youngest who is now in class sits close and holds my hand during all walking/dancing; but she will go up and get instruments and la-la’s. Millie: When we first started attending, Millie was very hesitant about participating. She would not dance, sing, or use the instruments. She would quietly watch the other kids doing those things but would often stand and watch in one spot while I would move around. This was something I was concerned about especially during those first few sessions, but Mrs. Kristi explained these were normal observer behaviors. Describe the ways you know your child is enjoying the class.When your child is in a familiar environment what does he/she say or do from WeJoySing class? Rylan: She is very excited the morning of class and can’t wait to get in the car and go. She rushes up the stairs to class. She talks about the class at home and when we pass by the church she excitedly says, “are we going to music class today?” She repeats several of the songs from class like Uuuuuup the hill and Doooooown the hill. She sweetly said that Mrs. Kristi is a good singer one day in the car! Millie: She is always excited and willing to come to class. When we pull into the parking lot she starts saying, “We’re here! We’re here! La-La Class!” Millie will sing the songs at home all the time and she likes to dance the movements. She gets really excited if any of the La-La Class songs are on the radio!! Talk about your feelings as the parent when your child is more of an observer. Rylan: It can be awkward at times. Others are usually very nice about it, but you can tell they may think it is odd. You want your child to participate more and really show she is enjoying it; however, having been through this with our older child, I know this is something my child enjoys and is a bonding experience for us. I try my best to let her be herself. It is good practice for her to feel out a new setting and determine how she wants to experience it. It’s ok if she wants to sit on my lap or hold my hand…she is still around other children, in an environment away from home, and listening and following instructions from a teacher. Millie: Oftentimes I would feel sad for her because I knew she would enjoy participating but for whatever reason is not comfortable in doing so. I don’t want her to miss out on anything, so I love that I now see her taking risks with new activities in class! La La’s after class…ALL BY MY SELF!!!! What changes have you seen in the amount of participation from the beginning? Rylan: My child started to participate around the start of her second consecutive session (fall and holiday). She is still reserved and mostly sits with me, but she will participate in the dances and walks a little more. She bravely joined in on the parachute and jumps up to put the mats up! She even proudly said her name one time during the introductions!!! We all cheered! She loves getting the la-la’s and proudly shows them to her older brother and sister. Millie: We reached a point where it seemed like Millie would participate in one new thing each week and it just grew from there. We have been attending for 10 months now and she fully participates in most activities. She especially loves the introduction song and will do the movements for The More We Get Together all the time! As a stay-at-home-with-grandma-while-mom-works kiddo she is also getting extra time around other kids her age which is a wonderful opportunity for social interactions! What do you see other parents, kids or teachers do that encourages your children to warm up at their own pace? Rylan: Both WeJoySing teachers we have had have been excellent at letting my quiet children be themselves and go at their own pace. They include my child, but don’t push when it is clear things are uncomfortable. The teacher responds positively when she participates or feels like moving away from mom. The kindness to me and my child seems to respect that it is OK to be a quiet child who sticks close to mom. 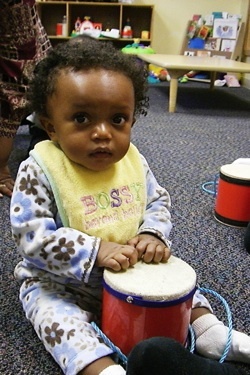 tHE JOY OF GROWING & LEARNING THROUGH MUSIC! What would you say to another parent with a child who likes to observe? Rylan: It is a great experience for you and your child, something to do together to build your relationship. Let your child be who he or she is and don’t sweat it if your child isn’t as outgoing or excitable. Let them enjoy it in their own way and know you are there to support them. 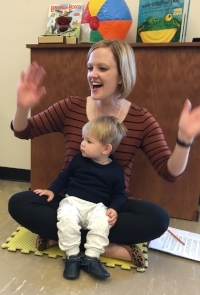 Millie: WeJoySing is a wonderful class where students get to engage in music at their own comfort level and ability. Since the activities are repeated week after week kids can get used to the expectations and appreciate the levels of consistency. WeJoySing’s deepest gratitude goes to the families who participated in this interview! Your comments have “calmed many” parent’s heart, soul, and mind!!! I’m here to tell you, YOUR “OBSERVER” IS JUST FINE!! It is through observation that your child learns…through watching. As your “little observer” watches the musical activity, he/she is mentally very busy processing all the information he/she is “meeting and greeting.” Your child is getting to know and understand the activity through observations. This observation process gives your child a greater sense of security once he/she begins to be actively involved with the experience. I CAN DO IT!! i CAN DO IT!! Perhaps your little one is an observer too. If so, you will connect with the parents I’ve interviewed. These four families have been attending WeJoySing for a minimum of 9 months up to 2.5 years and have had a variety of teachers within the WeJoySing program. Two of the children attend the evening sessions and two attend mornings. The parents were asked the same questions and you will see similarities in all the replies which show how your “little observer” is still gaining from his/her WeJoySing classes. In this two part series, you’ll read how these parents guided their child through this observation process to gain new skills and a greater sense of security to joyfully, on their own, actively participate in class. Kiran: She stares very intently at the instructor and very rarely sings along. She never used to do hand motions and when she did start joining in, it was always about halfway through the activity with tiny movements. She is doing a much better job now with Mrs. Kristi than I have ever seen in any sort of class before. Ryker: He is a great listener and is quick to collect and return instruments. Early on, he didn’t want to leave my side, but now he is eager to sit up close for the story books especially. He is always paying attention and aware of what others are doing. Describe the ways you know your child is enjoying the class. 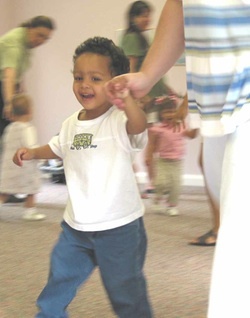 When your child is in a familiar environment what does he/she say or do from WeJoySing class? Ryker: Ryker always loves to sing the welcome and goodbye songs, and always has a smile on his face while doing so! He gets very excited when the instruments come out. He also runs up at the end of class for his La-La’s and to check out any instruments Mrs. Kristi shares with the class. He plays his instruments at home and remembers several songs from class! Kiran: When she was younger, I’d get a little exasperated; but I’ve tried pushing and it only made it worse. I don’t want to say I feel ‘embarrassed’, but it does occur to me that other parents may think I’m doing something wrong, or that she’s not participating because she doesn’t understand what is going on. Lots of patience! Kiran: The first session we attended had only two other families and the teacher had an enormous bear that Kiran just loved. In this younger class, she wasn’t expected to do much but sit in my lap and be loved! When we moved into the older class and the group was bigger and more boisterous, she clammed up and didn’t want to get instruments or anything. The improvements began when we re-joined in the fall. A big part was that Mrs. Kristi had monkey puppets and an extended monkey theme which happens to be Kiran’s favorite! We were also in a quieter, carpeted room and although the class wasn’t tiny, she knew several other kids. Kiran: The parents are always so supportive of all the children when they begin sharing their names at the beginning of class. Kiran clapped after introducing herself at a party the other, and I think it was because everyone always claps for her in WeJoySing class! Mrs. Kristi does a number of things that really helped Kiran warm up. 1). Those darling monkey puppets and making sure each child had a chance to pick one up each time they were used. Those little delightful things make a big difference. 2). Drawing the kids out of their parents’ laps slowly by enticing them versus explicitly pressuring them to be independent. 3). Drawing them into the joy of pretend. You can tell when my child is really wrapped up in the day’s narrative because she forgets her inhibitions and dives in. Mrs. Kristi sells the daily narratives really well and ties it together seamlessly. Ryker: Mrs. Kristi and all the parents clap and praise each child as they demonstrate some independence. Whether it be saying their name out loud or playing an instrument by themselves, it is such a warm, safe and inviting atmosphere. Kiran: Every child is different, and every class is different make-up; but there are lots of aspects of WeJoySing that can be seeds to a breakthrough! Whether it’s the exciting array of props and instruments, or the introduction ritual, the imaginative play or the La-La stamps; kids can build musicality through observation or from bringing class activities home. One of the best things we have brought home is the Clean-Up Song! It magically transforms putting things away from a chore into a joy…What parent doesn’t need that??? Ryker: WeJoySing is a wonderful program that provides creative movement and play while encouraging learning and individual development. It is an exciting and positive environment that truly encourages the children to do their best and have fun! WeJoySing sends a huge THANK YOU to the Kiran and Ryker Family!! During the holiday session, I was singing a lullaby to a class of babies. Lullay, thou little tiny child… (it’s in a minor key). An older sibling attending the class, left the circle during that song. I thought, “No big deal, maybe she needs to go to the bathroom.” When she returned, I noticed she had been crying. I asked what was wrong. Articulately, the little three-year-old replied, “That song makes me feel sad.” I love that music is so multi-faceted: that it is both mathematical and soulful, both deep and playful. Lullabies especially bring out the emotional side of music, they often have a slow tempo and sometimes are in a minor key. Anger sometimes happens, too. Music can help us express and work through that as well. For example, during the holiday session, we met a character named Sam. Sam didn’t like to wait. It took a long time for his cakes to bake. So, while he waited, he sang a little song. Wait, Sam, wait, Sam, do di diddle um, do di diddle um. But he REALLY didn’t like to wait. In my classes, he folded his arms across his chest, stomped his foot, put in his angry voice, and sang, Stomp, children, stomp, children, do di diddle um, do di diddle um. But then, guess what? The timer on the oven rang. The waiting was done. He ran JOYFULLY to get his cakes! He made it through the hard time! Most often, hard times make us grow stronger. Do we like struggles? No. Do we wish pain for our kids? No. But if we never take the risk, we will never see the view from the top of the mountain. Dare to open up. Try something new. Put your heart out there. Feel the Feels. And surround yourself with music every step of the way. How to Guide Your Child to be "Forever Young!" May God bless and keep you always. May your wishes all come true. And climb on every rung. May you grow up to be righteous. May you grow up to be true. And see the light surrounding you. And may you stay forever young. May your hands always be busy. May your heart always be joyful. But I also think this song speaks to us as parents. It’s easy to go on auto-pilot when we’re with our kids because we have “real-life” things to think about. But it’s important for us to spend time with our children in their world, not just drag them along in our adult world. We need to teach them that to be forever young is to be young at heart: to run and play and giggle and sing and act silly. These are the things that make for wonderful memories and precious bonding moments with your children. And as a WeJoySing teacher, I hope that the songs, stories and games and that make up our WeJoySing classes are the tools that you will take with you, to help make ordinary days special for you and your child. It seems to me that the last 3 lines of the song sum up the essence of WeJoySing. As we approach the holidays and the start of a new calendar year, this is my wish for all our WeJoySing families: May your heart always be joyful, may your song always be sung, and may you stay forever young. Forever Young & Young at Heart!! For Denise and Bob Foyle, this could not be truer than in the story of their darling daughter Bryn. Bryn was a triplet who came 4 months early, born at a mere 23 weeks and 6 days gestation. Bryn’s siblings, Jack and Cate, survived just 5 days before passing. 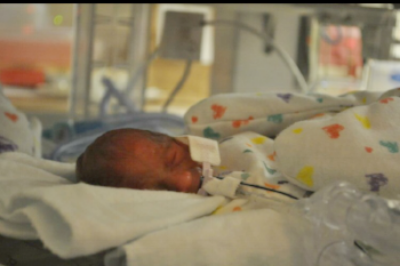 Despite being the smallest of the triplets at just 1 pound 3 ounces, dropping to only 13 ounces on her third day of life; Bryn continued to fight for 3 weeks at Riverside Hospital in Columbus, Ohio. Bryn was then transferred to Nationwide Children’s Hospital where she endured an emergency surgery for a ruptured bowel that was causing her to go septic and plummeting her survival rate to less than 5%. After another abdominal surgery, a laser eye surgery and a third abdominal surgery to reconnect her bowel and put in a feeding tube, Bryn finally left the hospital at 6 pounds and 5.5 months old. 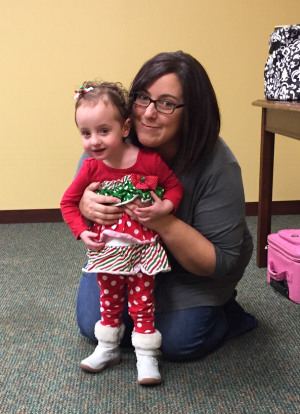 During Bryn’s stay at the hospital, Denise requested music therapy for her daughter. The same physiological effects that came from skin to skin time with Bryn’s parents were also present during music therapy. The monitors showcased her heart rate lowering and her respirations easing. A program called Sounds of Love allowed Bob and Denise to record their voices singing songs, reading Bible verses and telling stories, which could then be played in Bryn’s incubator at night to provide comfort for baby and parents. Once released to come home, it was imperative that Bryn be kept safe from germs, which meant limited visitors and only short trips to the doctor. During this time, Bryn’s aunt and uncles gifted her with some Raffi CD’s and videos. Denise noticed Bryn would turn her head toward the music and tended to be most calm when music was playing. Denise knew that music had to continue to be a part of Bryn’s life so she signed her up for WeJoySing when she was about 13 months old. Though Bryn was not walking yet, she would show her excitement in kicks, wiggles and a smile of pure joy while just pulling in the parking lot because she knew what was in store! bryn accompanying "The more we get together!!" 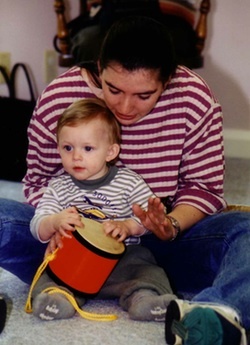 Denise is certain that Bryn’s progress in speech and language development were aided by her time in WeJoySing classes. Bryn’s social skills blossomed as she met children in her classes saying, “they met as one-year-old babies, and now they’re four and a half and still play together.” Denise also noted that even though attention span is something that children born pre-maturely tend to struggle with, she enjoyed watching the attention span of her daughter grow year by year. bryn & Mrs. Karen ....quite the loving pair!!! While Denise was not shy about sharing Bryn’s story, she noted that she never felt judgement from the WeJoySing community and instead felt a connection with the other mothers. “I didn’t get out a lot while she was little, so it was nice to have a weekly something to do with her to look forward to. 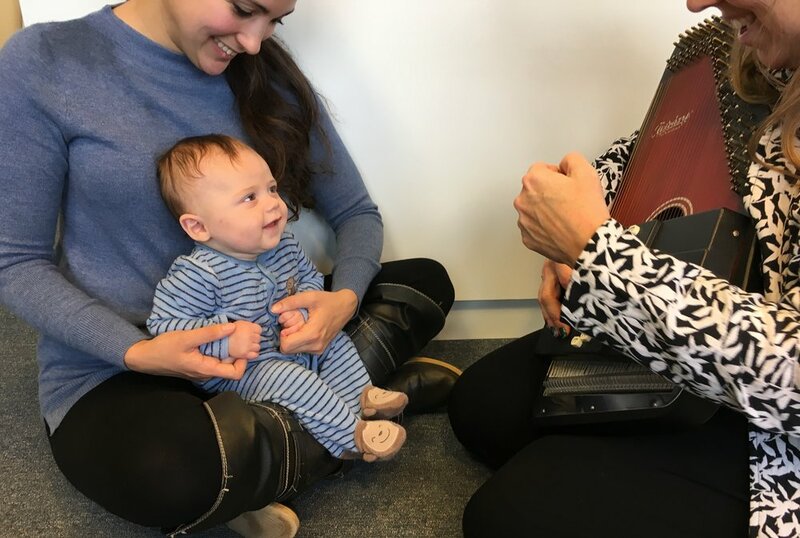 And to have the words at home so we could do the songs and finger plays!” Bryn’s instructor, Mrs. Karen, listened intently to Denise when she explained Bryn’s weakened immune system. She was always very careful to sanitize the instruments, give reminders about the sick kid policies and genuinely cared for Bryn’s well-being; so much so that she will still follow-up with Denise to inquire about Bryn! 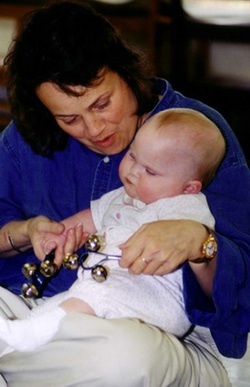 As Kodaly stated, the treasure that is music has certainly brightened the life of Bryn and her family and WeJoySing classes are here to brighten yours as well. We invite you to come to WeJoySing and together we will multiply all that is beautiful in your life! "Long Lonely Days" - Not at WeJoySing! I happened upon this quote while surfing social media and it immediately made me think of WeJoySing and parenthood. As parents, don’t we all know the “long loneliness”? While the years may be short, the days can definitely be long. We are overwhelmed by to-do lists that come along with raising little humans. These tasks have to be checked off the list by YOU, the parent. They are done in the dark early morning hours before your children wake, or long after they’ve gone to sleep. Some days, hours pass without speaking to another adult. It can be LONELY. friendship & community at WEjoysing! I remember taking my first-born to Mrs. Lynnette’s class for 13-24 month-olds. We were new to the area and I couldn’t take another second without some form of human contact (besides my needy toddler!). As I sat in her class for the first time, I nearly wept from the relief and joy I felt. Wow- here are some other moms JUST LIKE ME with toddlers who have the same needs as mine! Life outside of my four walls actually DOES EXIST! Friendships grew with these parents who brought their children each week. Playdates were made. Community was built. Imagine how powerful it is for children to be a part of a larger community! And now as an instructor for WeJoySing, I have had the privilege of watching these communities of families grow together. I hear parents talking before and after class about those nagging parenting issues that keep us all awake at night. I see parents filled with pride and joy as they watch each of the children reaching different milestones. What an honor and a blessing it is to witness these relationships growing over time. 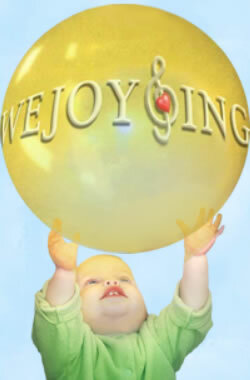 You see, WeJoySing is more than just a music class. Yes, children do develop lifelong skills from these classes. But I want you to know that these classes are so much more. They have been for me, and they can be for you, an answer to the “long loneliness”. What a gift! This is too good to keep to myself! I must share this response to a recent blog "Is Your "Emotional Bucket" Empty?" Thank YOU Paly! Thank you Mrs Jo!!! The article describes how I feel perfectly! I hope it encourages more families to keep coming to WeJoySing and to keep the joy going at home. We sang "The More We Get Together" for the first time with Mary last week. Annie and George were all smiles as we all sat in a circle together for music time. With the birth of Mary, I haven't made the time to sit and play with them as much lately. But I was the most excited of all of us. Holding Mary, just one month old, in my lap and swaying back and forth to that oh so familiar song... Her head flopping back and forth as we sang and my other children grinning. I took a deep breathe as I tried to take it all in. And instead of feeling overwhelmed and tired as I often do, I just felt... Joyful. And so blessed, to have these children and to have these tools you have shared with us. I hope you know that what you have created is so very special and unique. It truly changes lives. I am forever grateful.